Searching for a Home Appraisal in Spring, TX? Our Texas certified real estate appraisers provide residential and commercial appraisal services throughout the Spring area for both private use and lending applications. Our mission is to provide our clients with a fast, reliable and professional appraisal document that meets or exceeds their expectations and requirements for use. We have some of the lowest appraisal fees in the area and we take pride in delivering reports faster than the typical firm. All of our appraisers are Houston area locals and have over a decade of experience in the market area. We staff appraisers capable of handling any assignment from residential, commercial or mixed-use. If you have a commercial property assignment, most our Texas Certified General appraisers hold the MAI designation from the Appraisal Institute and are available across a large portion of South East Texas. Furthermore, our appraisers are able to provide valuation services for any use including lending, private matters, insurance, legal issues and any other situation that requires an accurate and reliable property value. Whether you’re a homeowner or an industry professional, we take pride in deliver a friendly and reliable service. If you have any questions or you’re ready to place an order, simply call the number on this site or complete the appraisal request form found above. 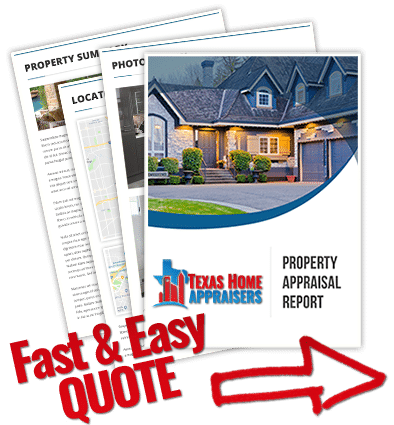 If you require a public houston property appraiser to perform a fast and affordable appraisal for your home, call our direct number today or fill out the short online quote form. What can I do to my home that will increase the value? When assessing the value of a home, an appraiser will take into consideration large improvements such as upgraded flooring throughout a home, high-end appliances, modern countertops, bathroom updates, extensive crown molding, covered patios and outdoor kitchens, and additional garage count. However, a local appraiser familiar with your market can help you figure out the best home-improvement value. Frankly, it’s apples and oranges. A CMA relies heavily on market trends to conclude value. For residential property an appraiser will also rely heavily on comparable properties, but the level of research and adjustments to each sale are much more in depth. An appraisal report will consider land values, cost approaches and income approaches in the case of rentals. A CMA delivers a “ball park figure”, an appraisal delivers a defensible and carefully documented opinion of value. Perhaps the most important factor to consider is the professional creating the report. Any Realtor can create a CMA without having competence within the market area or home valuation in general. Appraisers on the other hand are bound by ethics rules that require them to have market competence or disclose the lack thereof. The appraisal is created by a state certified professional who makes a living out of valuing properties. Will my lender provide a copy of the appraisal? They should, yes. Lenders are required to provide a copy of any appraisal reports ordered on your behalf regardless of the loan outcome. What is an appraisal contingency in a contract? A sales contingency based on appraisal means that should the property appraise for less than the contract price the buyer can withdraw from the contract without penalty. A good example would be selling your home for $300,000 but only getting an appraisal for $290,000. If the buyer had the contract written contingent on appraisal, then they would be allowed to exit the contract. LOWER FEES. FASTER TURN TIMES. BETTER REPORTS. We offer some of the fastest turn times in the Houston area. Get your appraisal report in days, NOT weeks! We pride ourselves on not only offering a fast & accurate appraisal service but one that is competitively priced. Appraisal reports are delivered via email & contain everything a client needs to understand how the appraiser determined value. GET A FAST HOME APPRAISAL QUOTE! How Much Will Your Home Appraisal Cost? This website does not automatically collect any personally identifiable information. If you complete a quote form located on this website, the information you submit is transmitted via email to our staff and stored on a web server. We do not sell or share of your information with any 3rd parties unless required to do so by law. Since the quote forms do not collected any information about you other than phone and email, you do not need to worry about any personal information being accessible by unauthorized parties. To ensure you receive the most accurate quote, each potential appraisal assignment is reviewed individually by our staff. Our quoted fee will depend on several factors including complexity of the assignment, intended use, as well as property and market area specifics. By following this process we are able to offer very competitive fees to the general public and real estate professionals alike. 720 N Post Oak Rd. © Texas Home Appraisers LLC. All Rights Reserved.